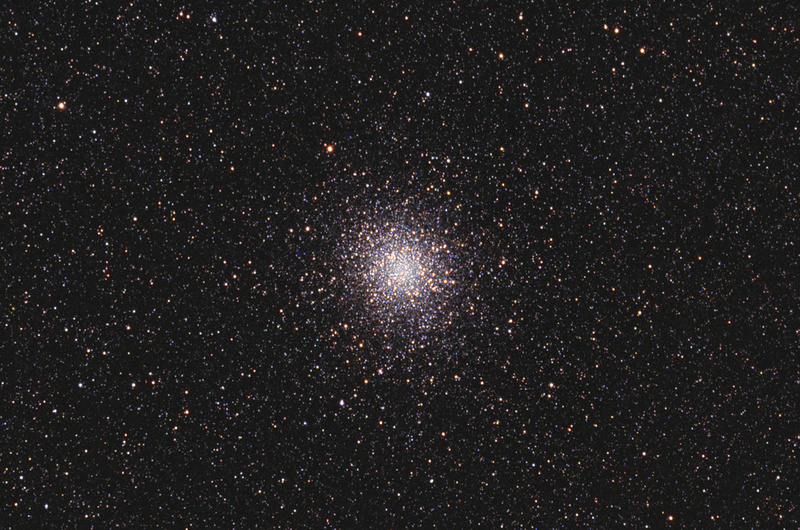 The globular cluster M22 which has been found to unusually host two black holes. Image Credit: Hunter Wilson. Astronomers have made the unexpected discovery of two black holes inside an ancient cluster of stars in our galaxy, the Milky Way. The research, published today in the prestigious journal Nature, describes the detection of two black holes that are about 10 to 20 times heavier than our Sun in the globular cluster named M22. Black holes, so dense that even light can’t escape them, are what is left when a massive star reaches the end of its life and collapses in on itself. 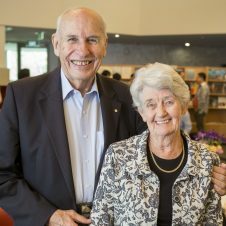 Co-author Dr James Miller-Jones, from the Curtin University node of the International Centre for Radio Astronomy Research (ICRAR), said the discovery of two black holes in the same cluster was a complete surprise. All the theory up to now says that should not happen in a globular cluster that is 12 billion years old. “The study was originally searching for just one larger black hole within the cluster of hundreds of thousands of stars which, when viewed from the naked eye, resembles a hazy round ‘puff’ of light,” he said. “The many black holes then sink towards the middle of the cluster where they begin a chaotic dance leading to most being thrown out of the cluster until only one surviving black hole remains. Dr Miller-Jones said the newly discovered black holes are the first to be found in a globular cluster in our galaxy. M22 is about 10,000 light years from Earth but can be seen clearly with a backyard telescope. “M22 may contain as many as 100 black holes but we can’t detect them unless they’re actively feeding on nearby stars,” he said. 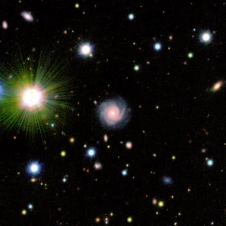 The research was led by Assistant Professor Jay Strader from Michigan State University and The Harvard-Smithsonian Center for Astrophysics and also involved colleagues from The National Radio Astronomy Observatory, The University of Utah in the United States and The University of Southampton in the United Kingdom. 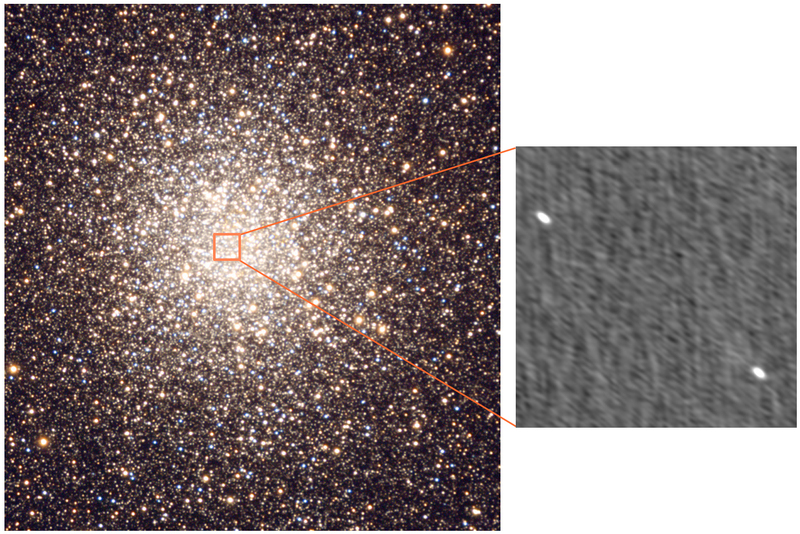 Globular cluster M22 on the left with the radio telescope image of the black holes on the right. Dr Miller-Jones and the team observed the black holes using the newly upgraded Karl G. Jansky Very Large Array (VLA) radio telescope. Image Credit Left: Doug Matthews, Adam Block, NOAO, AURA and NSF. Image Credit Right: Assistant Professor Jay Strader, Michigan State University and The Harvard-Smithsonian Center for Astrophysics. Click for highest resolution.